A member of the Fallout mod community has recreated the haunting current state of Japan's Fukushima Nuclear Power Plant within the wastelands of Fallout 3. 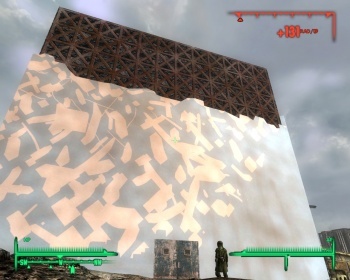 Appearing on the Fallout 3 mod community, Fallout 3 Nexus, the mod allows players to enter the power plant in Japan recently compromised by the devastating Sendai earthquake. The mod seems to only place the nuclear power plant into the game as a place to explore, and its creator, KOBJ, claims in the description that "this is not to mock the earthquake." It doesn't write because it becomes a political comment. This is not to mock the earthquake has not made. I mean it is not. Please guess the meaning Tenpenny Tower. Explanation was requested from several, I write though I do not want to write so much. 1.When news was seen,recruited it by the nuclear power plant worker hourly wage 200,000 yen(2,378 USD). 2.However, it is impossible to work for one hour because there are a lot of radiations. 4.But When exposed to radiation, The stem cell treatment expense 200,000 yen(2,378 USD) is a portion of medical expense to be paid individually. The question quickly becomes whether or not this mod has been created too soon, as only a month's time has elapsed since the beginning of Japan's woes. The Fallout 3 mod community is sounding off with mixed reactions in the forums of Fallout 3 Nexus as well as mixed feelings from gamers in Japan. As more Fallout fans catch wind of the mod, it will be interesting to see various fan reactions.